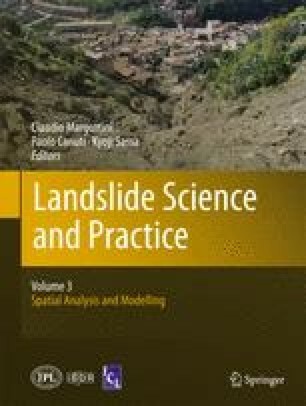 This paper deals with the theoretical-numerical and experimental analysis of dry rock avalanches moving down a chute. Depth-averaged field equations of balance of mass and momentum as prescribed by Savage and Hutter (1991) are implemented in the RASH3D code. They describe the temporal evolution of the depth averaged velocity and the distribution of the avalanche depth. A Coulomb-type mechanical behavior of the mass is assumed. To incorporate the curvature effects of the bed, the centripetal acceleration term has been here implemented in the code. Carried out experiments consist in the release of granular material on an inclined plane that is connected to a horizontal run-out zone through a sharp transition. Comparison of the experimental findings with the computational results proved that neglecting the centripetal acceleration term can have the effect of leading to errors in the determination of the well fitted friction angle. In particular, an overestimation of the computed dynamic friction angle respect to its measured value is observed. The authors wish to thank Anne Mangeney (IPGP, France) and Marie-Odile Bristeau (INRIA, France) for having offered the use of the SHWCIN code and for having helped to solve some fundamental numerical problems.